These acrylic mini coin easels and coin stands work great for displaying 2x2s, Slabs, and Air-Tites. 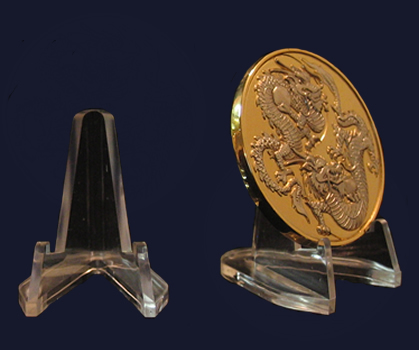 Height: 1 1/2" Width: 1 1/4" Depth: 1 1/2"
this is a great little display stand for police badges. they go inside a glass display dome. I've tried other stands, and they just don't look the same on display. they have more of an angle, this one's perfect, the badge stands up straight on this one.